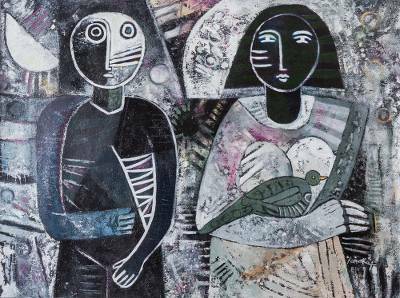 Signed Black and White Cubist Painting from Peru, "Moonlight"
A couple stands together under the glowing moonlight, depicted in this painting by Peruvian artist Juan Carlos Ñañake. He works in the cubist style, using mixed media to depict his subjects with slightly distorted figures that add emotional depth to the composition. For the artist, the contrasting light and dark colors of this painting represent the complicated world that surrounds the couple, full of obstacles that the two must overcome together. Titled Luz de luna in Spanish.